I am sitting here in an internet cafe in Ventienne, Laos, which is the capital. Sitting beside me is a monk dressed in his saffron robe and bright yellow sash. I'm trying to snoop and see who he is emailing, but I just can't see. Monks are everywhere here in Laos. I'm beginning to take them and their soft faces and beautiful bright colors for granted... What a wonderful luxury! All of Laos is a luxurious visual treat. I arrived through the Northern Thailand border and spent two long days floating down the Mekong river towards Luang Prabang, the historical royal capitol of old Laos. The boat was rustic to say the least. 40 people we crammed into a freight boat with bare plywood benches for 7 hours the first day and 9 the second. Although at moments when my muscles ached I wondered why I didn't just fly in the end, I couldn't help but feel blessed that I had the time to float in such amazing scenery. The Mekong is the 12th longest and the 8th most powerful river in the world and its size and strength inspired me. Since Laos is largely undeveloped we saw very few huts on the coast and instead feasted our eyes on mountain ranges covered with lush jungle and limestone cliffs. At the end of the journey we piled off the boat into Luang Prabang, a magical place filled with historical Buddhist temples and classic French colonial architecture. It is yet another UNESCO world heritage site and their careful restoration of the buildings, temples, sidewalks... makes it a truly special place. The Buddhist presence is seeping out of every corner and crevice. We were very lucky to arrive at one of the most special times of the year, the first full moon after the rainy season. 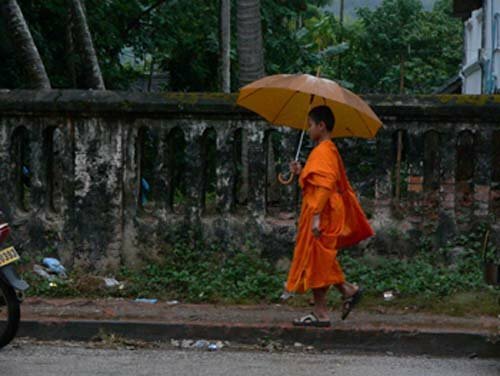 Monks have had to spend the whole rainy season, 3 months, at their temples and now after the full moon they are able to travel the country again and go home to see their families. This is a reason to celebrate! At 4am on our first morning, we heard the pounding of drums shake our hotel room. I promptly ran outside to see what was going on. We learned that for three days they would beat the drums and ring bells in all the temples at 4am and 4pm. The reason I jumped up so quickly is that Luang Prabang is known for a special custom. I knew it was going to happen, but I didn't know when and didn't want to miss it. Each morning all the monks walk through the town in a precession. The town’s people kneel on the sides of the road and place alms, which are in the form of sticky rice and coconut jelly treats wrapped in banana leaves, into the monk's baskets providing them their food for the day. Luckily they don't start till 6am so I could go out and watch each morning of my stay. 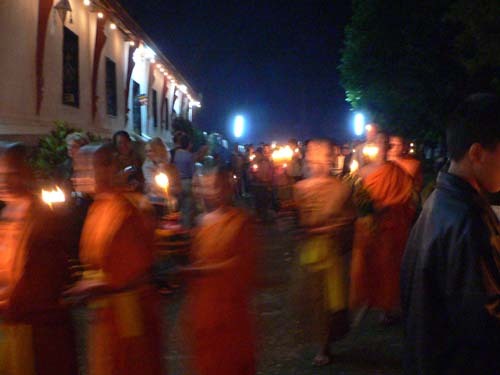 All the monks from all the temples eventually join up on the main street and form a line of about 200 monks. It's a majestic sight! Luang Prabang has over 35 temples, so most of the activities there are walking (or biking, which we did for two days) and looking and ornate temple after ornate temple. 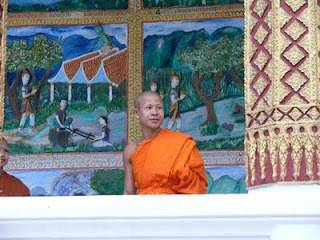 One afternoon we walked into a temple’s grounds and said hello to a monk. He motioned to us to come up where he was. As we followed all the monks began to go inside the temple. Before we knew it we were invited inside and were kneeling in the back of the temple while 50 monks chanted below the eyes of placid benevolent Buddha. This was a stunning experience. The sounds shook me and the beauty around me stimulated my senses. The sound of their voices was the most enchanting display of religious faith that I have ever seen. When the chanting stopped and the teaching began, we felt we should leave them to their private sessions. 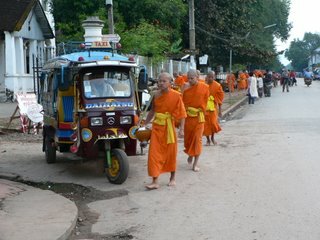 The funny part though was that five monks followed us out so they could speak with us. While we were speaking, one of them invited us to a nearby temple for a candlelit precession to celebrate the full moon. We had known these celebrations existed around town but couldn't get any information about them in the tourist areas we had been staying so we were very VERY happy to be invited. As we approached the temple, we could not miss that something was going on. There were lights, games and tables selling food, candy and flowers. There were local people streaming into the grounds. Luckily when we were struggling to figure out what was going on, (What time does it actually start? What’s going to happen? Should we buy candles and flowers? Humm, I'm hungry but what is that stuff they are selling???) our new monk friends popped up to explain that we needed flowers, incense and candles to burn in a candlelight precession where we would walk around the outside of the temple while being serenaded by drums, bells and chants. Our flowers would then be left as a gift to Buddha. It was so special to be able to be in such a local event. We were able to see the Lao people in their most festive moods and see their teenagers flirt; watch boys hang in groups across the way from the girls; see little kids run around and play... It was just like home. The other good thing about Luang Prabang is that it’s a very small city (16,000) so everywhere you go you see the same faces. That meant always meeting someone to eat a meal with or discuss the beauty of a temple. We also had our 40 friends from the slow boat that we bumped into at every turn. This small town hospitality made for a very warm experience. But alas, we couldn't stay there forever! There was a whole country to see! So we hired a car and wound through the high mountains passes on to our next stop, The Plain of Jars. The Plain of Jars are an archaeological site covering many acres of Northern Laos. Huge carved stone vessels dot the countryside. These urns, some up to 9ft tall, are thought to have been funerary urns used to hold the ashes of deceased nobility. They date back to 500 BC - 500 AD. This area of Laos was where the "secret war" of 1960-1970 was fought. The US and the Vietnamese fought each other so secretly that in congressional records of the time there is no mention of the name of the country that the fighting is going on in. We were spending over 2 million dollars a day, which makes it the most expensive war in history and it is said that still today this the most heavily bombed part of the world. Among the Plain of Jars and up on the hillsides, there are massive craters from bombs and the countryside is still charred from Agent Orange and Napalm making it useless for growing anything. What land there is to farm is also largely unusable because it is covered with unexploded munitions. It is believed that today 25% of the bombs we dropped have not been detonated and lie among the hillsides where the people live. In fact, our guide had two friends who died a few years ago while trying to transport one of these bombs home to sell for scrap metal. Remnants of the exploded bombs are everywhere. The bomb casings are used for fences, planters, tables and even a bonfire pit for the guest house we stayed at. As I have said before, Laos is a largely undeveloped country. It has a very low density of people which means as you drive you can see miles and miles of untouched mountain ranges. The roads weave around the edges of mountains high in the sky and above the cloud line. The terrain is covered with lush jungle with banana plants, bamboo, palm trees mixed with a sea of other green trees and vines. All the flat areas are covered with rice paddies where giant water buffalos graze. Laos is one of the 10 poorest countries in the world and its people lead a hard life of subsistence farming. Little children play in the streets and although there is free primary school, it is not evident that everyone gets to them. Since there are few cars, carts resembling large wheel barrels are pushed along the side of the road piled high with bananas, wood and bamboo. Women walk with both babies and baskets on their backs. Although the men wear western dress, the women all wear their sins which are always pressed traditional long straight silk skirts with a band of ornate trim at the bottom, sparkling in the light. Now finally to my last stop, Ventienne, the country's capital where I am today. Ventienne is a small town nestled in the banks of the Mekong and its very hard to believe that this is the capital, though there is one grand boulevard in pure French style that is lined with large government buildings and a palace on one end that would only exist in a capital city. - Drinking Beer Lao (VERY good beer) at sunset at the small food stalls that line the river’s edge, watching fisherman take their boats up and down the river slow throwing nets in to catch whatever is available. - Going to the history museum and learning about the "American Imperialists and their puppets" during the war and learning about the accomplishments of the communist government here. - Checking out the morning market, which sprawls for long distances and sells almost anything your heart desires (clothes, jewelry, bicycles, TVs, fabric...) but unlike the market near the Plain of Jars I can't find the food market which there sold parrots, hawks, squirrels, mongooses, frogs, bats and many other unidentified dead animals, a truly disturbing sight to see. 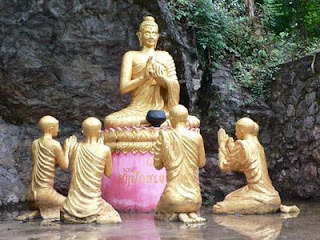 - Walking temple grounds and seeing some of the great Buddhist treasure of Laos. - Having tradition Lao massages!!! - And sitting in bars with all the ex-pat aid workers and seeing where business really gets done. 70% percent of Laos budget is from aid money. Today I say goodbye to Laos. I will spend the next week in the mountains of Northern Thailand at an elephant rescue camp. It will give me a chance to do some good and experience the more rustic side of living here. Soon I will be back in New York and start looking for a job... For now though, I think I'll go get one more slice of watermelon from the bicycle cart that’s ringing it bell outside and try to soak in a little more of Southeast Asia. many of you have been emailing wondering where i am. i was supposed to be job searching after the election, but i met someone who wanted to travel to laos while i was in africa and thought if not now, when? so here i am in southeast asia. i have been traveling for two weeks to hong kong, bangkok, thailand and now to see angkor wat in cambodia. i meet my friend tomorrow. yes, i am on a tour of continents and savoring every moment. it is so satisfying to read travel magazines and know i have been to so many places they have written about all in one year! i have become an adventurous traveler with very few fears. i wander the streets,look at the people and revel in the experience of seeing a world so very different from my own. my first stop was hong kong. i visited friends there and got to see a REALLY big city. i thought i was prepared for high rises after living in new york. but we live in a little city in comparison. there are many many 50 story residential and commercial high rises jumping out of every free flat space. in reality hong kong is a mountainous area that has preserved 48% of its land as parkland, so while there are many tall buildings there are also rolling mountain sides covered with forest. hiking is one of the "things" to do there, which seemed out of place for the commercial center of the world. don't be fooled though. there is lots of commerce going on there. i saw some of the nicest malls i have ever seen, since they are the open the public spaces where people congregate in the scorching heat. there are also incredible markets. its china town in new york x 100. they have many special shopping markets. my favorite was the bird market where every imaginable type of bird is available for sale and sitting in small cages that line the streets. i think if i lived there i would have many many little birds since they had a magical quality about them. i also liked the goldfish market, where store after store was filled with fish of all types and colors. there also is: a huge jade market, a big women's clothing market, an electronic market, a flower market and a computer center... that are all beside each other in the streets on one neighborhood. bangkok is another huge city. so huge that i only saw two small parts of it so far and don't even really know where the tall buildings are. i did the tourist sites. in this area of the world that means buddhist temple after buddhist temple. there are temples in every nook at cranny of the city and small shrines set up outside shops and on sidewalks. the temples i visited were absolutely stunning. they are very ornate with beautiful tiled patterns on the roofs and walls. inside the buildings there are buddhas of all shapes and sizes. 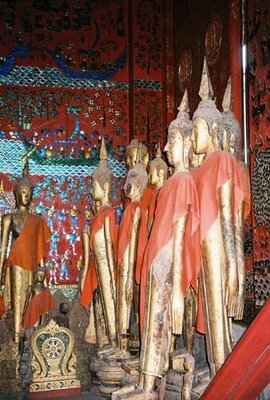 there is a 120 ft reclining buddha, a 3 ft jade buddha, who may be the most famous of them all, and a 12 foot tall sold gold buddha. i stayed in in the tourist ghetto of bangkok. its mostly one street called khao san road where all the guest houses are located and many of the backpackers stay. its hard to explain what this place looked like. there are shops and stalls lining the street selling clothes and thai souvenirs. there are many carts that sell freshly made thai food. there are people braiding peoples hair in the middle of the street. there are places to email and places to set up your next trip. but best of all, there are bars with outdoor terraces so you can have a beer and watch the scene while listening to blasting american music. although the street is not officially closed, the pedestrians make it almost impossible for cars to get by, so mostly the cars don't even try. sitting and watching the people was fabulous. i'm not exactly the bohemian backpacker type, but i could definitely see that this is the kind of place that many people would like to drop out in and from the looks of it many of them do. now it was time to leave the city and travel a bit more off the beaten path to siem reap, cambodia. this is the home of angkor wat, one of the seven wonders of the world and i can tell you it is wonderful! surrounding this town are 16 km of khmer temples from the 9-12th centuries. the khmer empire ruled much of south east asia during that time. words can't really describe these temples but once again i will try. the are big and bigger and sit right next to each other. 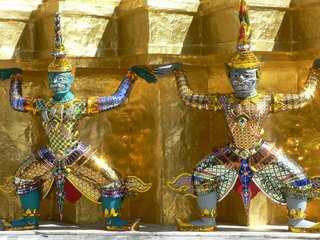 different kings built them to reverve both the buddhist and hindu faiths depending on the years of the empire. in fact an interesting sight is where they changed the carvings of the god's to match the faith of the time. 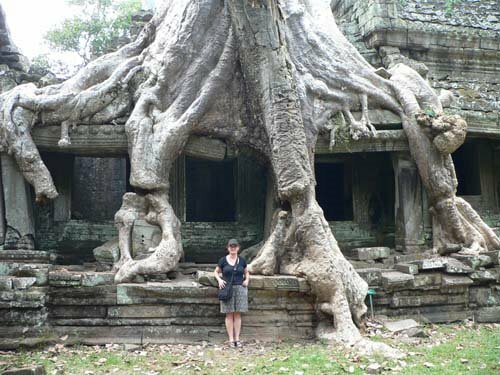 after 1000 years of living in a lush jungle all of the temples were covered in trees and vines when the french discovered then in the 20's. since then there has been a major effort to reconstruct them. although some have been mostly put back up, i really liked the ones with the trees growing right through them. the trees, which started as little seedlings, have spent over 200 years growing into towering beings with root bases just as big. the roots have literally picked up big stones and tossed them to the side or just wrapped themselves around them. i went to over 20 temples so i can't describe any one in particular but this is definitely something to see. its sheer size shows both the extreme power and wealth of an empire and how deeply rooted buddhism is in this region. one thing i did notice is that the biggest temples were built in the last years of the empire. once again an empire's head got bigger than its real strength. since cambodia until recently was ruled by a very evil dictatorship, these temples have been closed to the west and tourism for 30 years. that means the tourist industry is just developing here. the great adventure is that you can walk everywhere and see everything at these temples unlike many other places that i have been in the world. although i know that i shouldn't walk on them it is a great privilege to climb to the top of these stone mountains and experience them fully. siem reap, which was a small town ten years ago is growing by leaps and bounds. huge hotels are being built all over the place. western restaurants are being opened, but still the tourists here in old town where i am staying have a distinctive end of the world feel. these are the people who like to be places first. we stay in hotels with few amenities and eat street food. (i say we, but i am still not feeling like one of them. they seem hipper than me.) this town is in a major state of change and its very exciting to be here in the beginning and see it first. my favorite place to sit was at an open restaurant across the street from the old market. all combined i spent hours there eating, drinking but mostly watching all the people go by. it was a perfect place to sit to try to observe the daily life there. now i am off to northern thailand and then to laos, an even more untouched and untouristed world. i am really enjoying my adventure.